When your feet are in pain, your whole body suffers. You feel it with every step, you walk differently to avoid the discomfort, and the effects are detrimental to your joints and muscles from the ground up. More importantly, your quality of life and ability to do the activities you love without pain is impaired. Our comprehensive skin and nail care appointments thoroughly care for any pains and problems you may be experiencing with your toenails and any skin conditions, such as corns, callus, verrucas and ingrown toenails. Using expert tools sourced from Europe, we’re able to immediately reduce the pain and discomfort associated with these conditions. 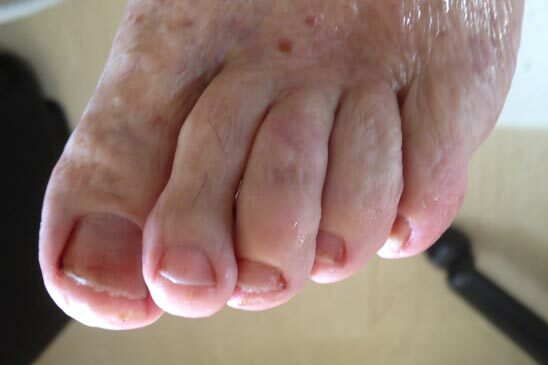 All our treatments are performed by our highly-skilled and experienced Podiatrists and comply with board-regulated safety and sterility protocols. With every treatment, we work to not only treat your current problems, but also to stop them from recurring in the future so that we improve your quality of life. With Dynamic Podiatry, we understand the effect that foot problems can have on your life and will always do our best for your health and well-being.